'S e eaconamaiche às na Stàitean Aonaichte a tha ann an Kenneth Joseph Arrow. Rugadh e ann an Eabhraig Nuadh 23 an Lùnasdal 1921 agus bha e na oileanach aig Oilthigh Cholumbia far an do sgrìobh e an tràchdas aige. Dh'obair e cuideachd aig Oilthigh Chicago. Dh'imrich e gu Oilthigh Stanford ann an 1949, far an do chaidh e na ollamh agus mhair e an sin gu ruige 1968, nuair a dh'imrich e gu Oilthigh Harvard. Chaochail e 21 an Gearran 2017. Còmhla ri John Hicks bhuannaich e an Duais Nobel ann an Eaconomachd ann an 1972. 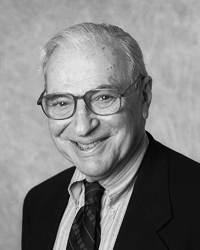 ↑ “Kenneth J. Arrow - Biographical”. Nobel Media AB. Air a thogail 10mh dhen t-Samhain 2017. Air a tharraing à "https://gd.wikipedia.org/w/index.php?title=Kenneth_Arrow&oldid=540034"
Chaidh an duilleag seo a dheasachadh 10 dhen t-Samhain 2017 aig 20:45 turas mu dheireadh.